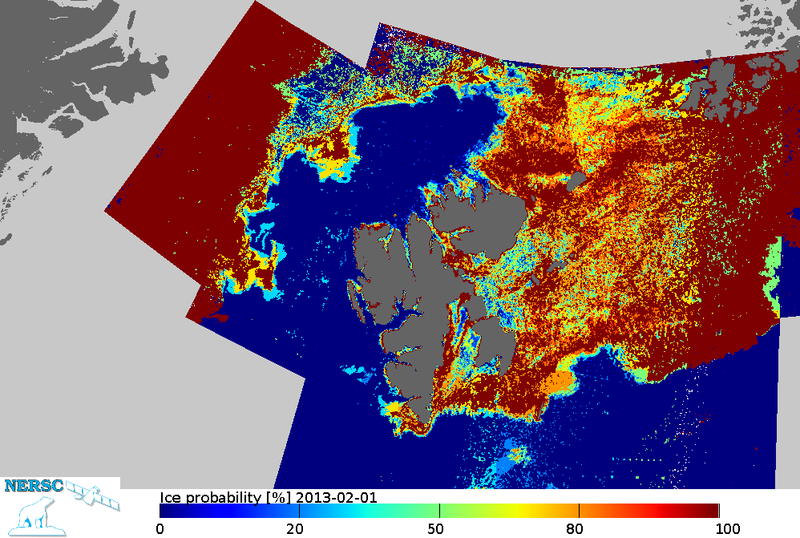 An automatic procedure for Radarsat2 data processing and daily mapping of ice in the Barents Sea (around Svalbard) at 1 km spatial resolution has been developed and run autonomously. The procedure is built on top of the satellite data management system (NERSC-SDMS). SDMS is used for collecting metadata from all satellite imagery available at NERSC. It consists of PostGIS relational database and a suite of Python libraries for accessing the database and reading satellite data. NANSAT, a scientist friendly Python toolbox for satellite data processing, has been developed at NERSC for (1) easy development and testing of scientific algorithms, (2) easy analysis of geospatial data, and (3) efficient operational processing. All RADARSAT-2 data available within MyOcean2 project are downloaded from the GMES DWH to the NERSC server, uncompressed and processed first at Level 2 (image-per-image ice/water classification) and then at Level 3 (daily maps generation). L2 processing includes correction for thermal and random noise, calculation of texture characteristics and processing with neural network. L3 processing includes reprojection of each input image into a common projection (spatial binning), temporal averaging of images taken within one day or within one week and generation of maps in graphical format. A web-site for accessing L2 and L3 results of RADARSAT-2 processing has been established. Results of classification are also provided to the Norwegian Meteorological Institute in NetCDF/CF files within the MyOcean2 project and are available online. Figure 1. Example of sea ice classification map averaged over 7 days for February 2, 2013.